4.2 out of 5 based on 37 bloggers and 3 commenters. 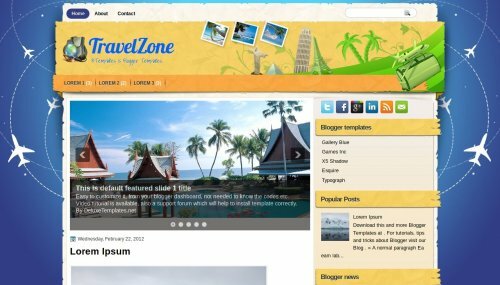 TravelZone is a free blogger template with 2 columns, right sidebar, fresh look, slider, social bookmarking icons and vectorial elements. Excellent template for blogs about to write a diary, photography or travel. Wonderful template. Love it and will use it. Thanks for the upload.